I've been pleasantly surprised to learn that Judah actually enjoys cooking and baking with me. 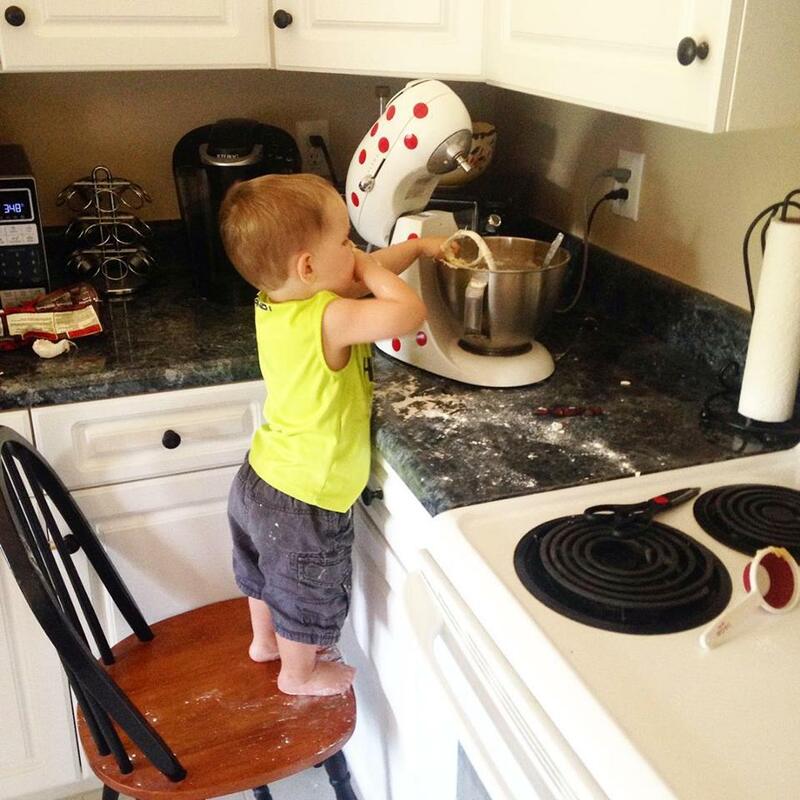 I used to let him sit on the counter beside me, but at 18 months, that quickly became a hazard because of all the hot pots and pans I work with. I began researching and decided that I really wanted to buy a Little Helper Tower; however, my bank account said otherwise. Guess who won? So we went old school and grabbed a kitchen chair, placed it in the corner of our kitchen so that he was completely surrounded, and I let him stand on that at the counter (totally supervised). Needless to say he's really taken off, and I believe there can be huge advantages to letting your child cook with you. Granted, the tools used and the recipes cited will determine how involved the youngsters will be in order to ensure their safety. 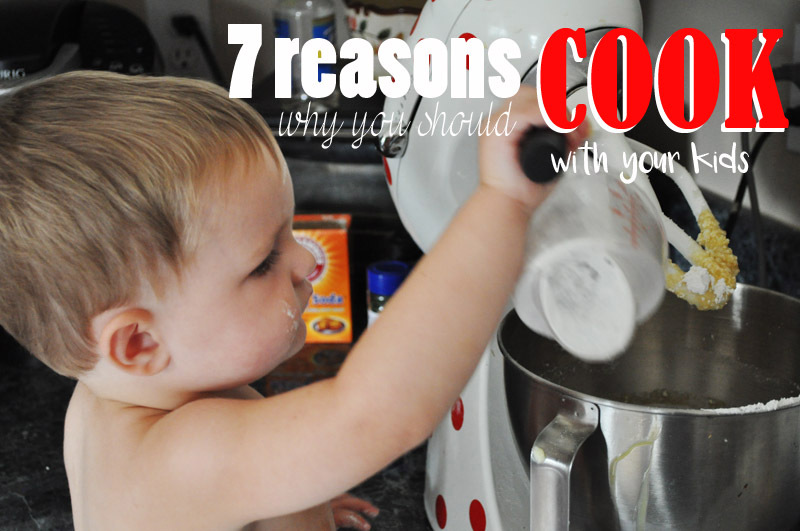 Below I've listed 7 reasons why I believe it is beneficial to let a child cook with their parent at a young age. 1. It is an essential life skill. With all the modern conveniences of fast food and frozen dinners, cooking is truly becoming a lost art. I don't believe the majority children grow up learning how to actually cook a meal that doesn't have warming instructions on the box. This leaves them lacking in a pretty major area when they leave the nest. I know this because I married that guy, and I spent 3 years of my college career cooking for him. He could literally boil a hot dog when I met him. He can still only boil a hot dog. When I leave town, it's Chick-fil-A fo dayz at our house. I'm not saying our kids need to be making beef bourguignon, but since the invention of the microwave, cooking skills have definitely fallen below par. It seems that our kids deserve a well-rounded education that includes skills they will actually use in life. Am I the only parent who is so over coloring books and legos? If you're scared of the mess, buy a tablecloth from the dollar store and put it under the tower/chair/table and toss it when you're done. But bottom line, there's a reason there are so many edible play recipes on Pinterest. Because it's fun. 3. They might actually eat it if they make it. There's a sense of pride that comes with cooking. If a child has a hand in preparing a meal, they are more likely to take part in it. I've wained on many things as a parent. We've done sleep training, formula, Sesame Street and candy, all which I swore wouldn't be parts of our family equation. Bless my heart, I still don't have it all figured out. But I'm a big believer in independence. This is probably a reflection of the way I was raised. Granted, my parents weren't perfect, but I appreciate that independence was pushed on me from a young age. I flew alone across the country to visit family starting when I was in elementary school. By then, I knew how to book a flight, check my bags, get to my gate, and find my seat. This is just an example of what I'm talking about. I firmly believe we need to lovingly equip our children for the real world, because baby, it's coming. Cooking is one of the realities of life, so we need to teach it to our kids. Judah can't talk yet, but even now, I talk, and he babbles back. We are spending quality time together away from a screen or loud noises or huge distractions. 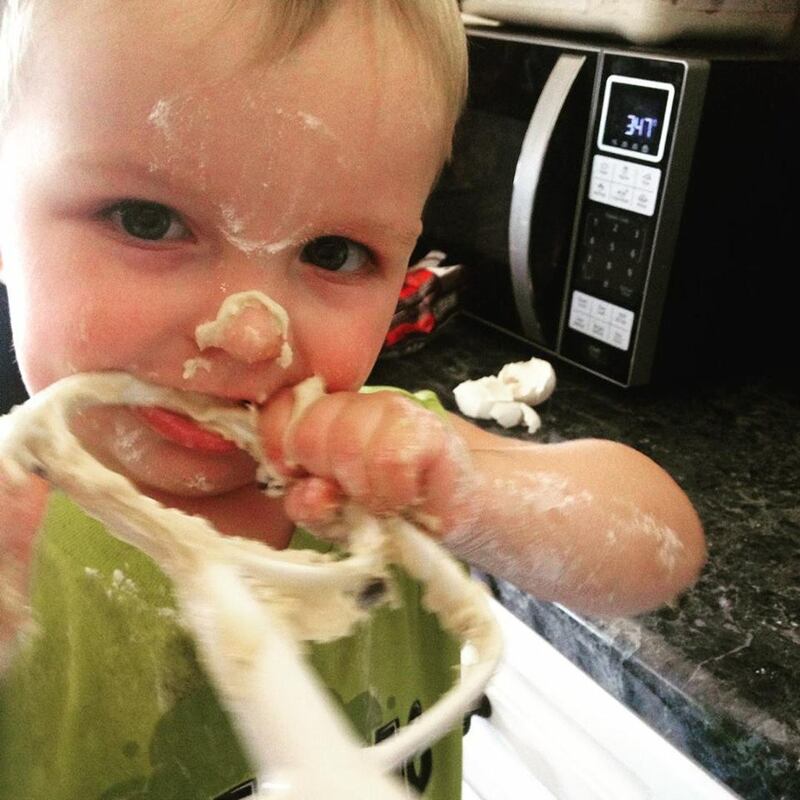 It's hands-on, messy, totally-worth-it bonding time. 6. Cooking teaches patience and that with hard work, there are rewards. The attention span of today's child is less than that of a gnat. I made that up, but I'm sure it's probably pretty accurate. Cooking forces a child to slow down, follow instructions, use their fine motor skills, and actually wait an allotted amount of time for the item to finish cooking. This increase in patience also gives them more self-control. And Lord knows we need more of that in the world. Cooking also allows children to enjoy the fruits of their labor. I have never seen Judah enjoy a cookie more than when he ate the one he had made himself. That 20 minutes in the kitchen taught him more about hard work than I could teach him in an hour of flannel graph lessons. Sometimes, mom or dad are viewed as short-hand cooks, and entitlement and ungratefulness are practically contagious in today's world. When an individual, child or not, sees all that goes into making a meal firsthand, it cultivates appreciation when someone does that for you three times a day, year-round. That's all I've got. If you're hesitant to try this, try having your kids pack their own lunches for school. That's a great start for teaching them responsibility over their food. If you're ready to start cooking with your kids, there are tons of great ideas on Pinterest, from toddler to high school. There are so many different factors at work when cooking with children. It might be more difficult to do if you have multiple children, or if you work full-time. I often fall into the pattern of doing things for Judah just because I want it to get done faster and correctly. There's no shame in this happening occasionally, but I want to encourage you to embrace the mess and the slower pace whenever possible so that your children can learn this essential life skill.